Deal volume year to date is up slightly, compared to the same period in 2016. 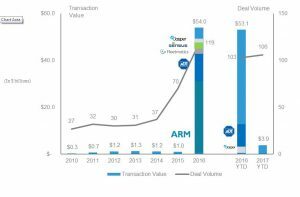 However, 2016 is proving to be the record year in IoT M&A in terms of dollar volume, with its multibillion-dollar deals such as ARM, Fleetmatics and Jasper. For 2017 year to date, we have seen a total of 106 transactions close, a slight increase compared to the 103 closed in the same time frame in 2016. 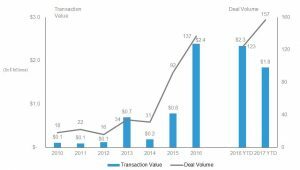 It should be noted, in addition, that deal volume so far in 2017 exceeds each of the five full years from 2010 to 2014. More significantly, perhaps, is the absence of transactions over $1 billion in 2017. Total disclosed transaction value of $3.9 billion in 2017 year to date is $49.2 billion lower than that of the same period in 2016, a period which included SoftBank’s $31 billion acquisition of ARM Holdings and Apollo Global Management’s $12.4 billion acquisition of ADT. Still, even when excluding these two largest deals in 2016, 2017 figures do not come close. That said, there are a few deals currently pending that are above $1 billion in transaction value, including the $49 billion acquisition of NXP Semiconductors by Qualcomm and the $1 billion acquisition of Silver Spring Networks by Itron. Should the Qualcomm/NXP deal close in calendar 2017, dollar volume would be approximately equal to that of 2016; however, regulatory approvals could push the deal into 2018. The biggest deals in 2017 year to date are the acquisition of ServiceMax, a cloud-based asset-tracking and field management company, by General Electric Digital for $915 million, the acquisition of China Merchants Logistics Holding, a supply chain management and transportation services company, by Sinotrans for $818 million and the acquisition of Comptel Oyj, a data fabric and advanced IoT analytics company, by Nokia Solutions for $373 million. 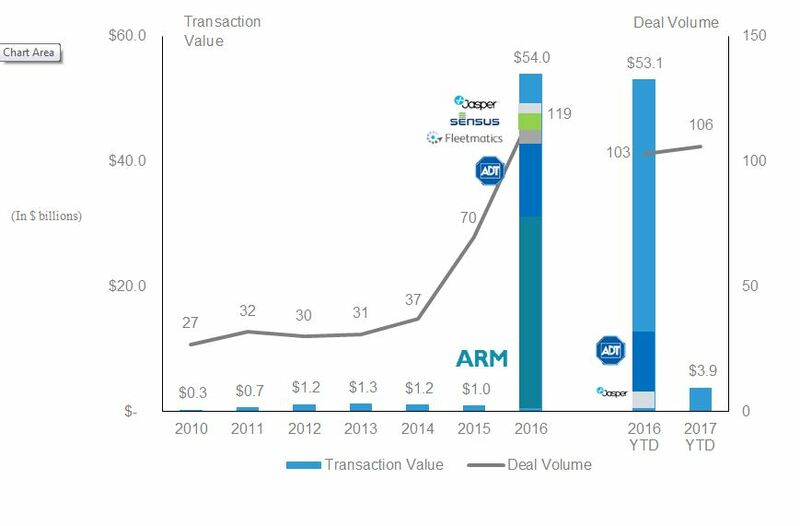 While telematics technologies represented almost half of the 2016 IoT M&A transactions (approximately 60 transactions out of 119), followed by hardware and devices, the Comptel Oyj/Nokia transaction is symptomatic of the strong interests in IoT analytics (big data for IoT), security, smart offices and homes. Similarly, private placement volume year to date is up, while dollar volume is down, when compared to the same period in 2016. Private placement transaction volume for 2017 year to date has experienced an increase in total transactions (157 versus 123 in 2016 year to date), representing an increase of 26.7% and setting a new record in the IoT sector. Dollar volume has slipped from $2.3 billion in 2016 to $1.8 billion in 2017 year to date. As a result of higher transaction volume and lower total deal size, average deal size has significantly decreased, from $18.7 million to $11.4 million. In 2017, earlier stage financing rounds (series A and B) have contributed to the lower dollar volume and average deal size. 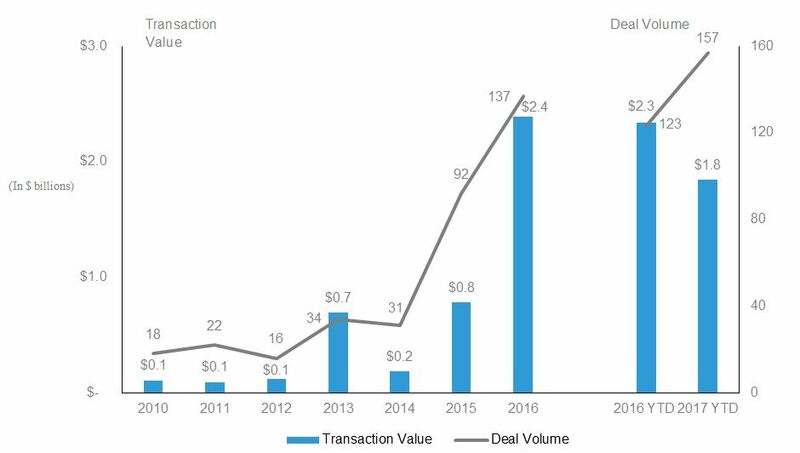 Just as we saw in the M&A market, record dollar volume in 2016 was driven by a few large deals. Infineon’s Series E financing of $935 million and Sigfox’s raising of $160 million together accounted for almost half of total dollar volume for 2016 year to date and were a major influence on average deal size. The most significant private placement in 2017 thus far is the $500 million raising by BluJay Solutions, which offers supply chain and fleet management solutions, in August.